They smartly call these two models aimed at consumers up to small businesses their Wireless-G IP Phones: The WIP300 and WIP330 have a similar feature set, but the WIP330 is clearly aimed at road warriors, while the WIP300 is more of a home or small office phone. With a 2.2-inch color LCD, the WIP330 includes a Web browser, which allows the phone to authenticate at locations that have a splash page--even just one that requires you to agree to a set of conditions to connect. After reviewing the phone's manual, I see that it offers 802.1X with PEAP, which is used by iBahn and T-Mobile as an optional secure authentication method, as well as by smart IT departments that use Wi-Fi. There's also an easy way to store profiles for hotspots for quick reconnection. This is the first VoWLAN phone that--if it performs as advertised--is worthwhile to buy for use hotspots and on company networks alike, as it will handle authentication. Now the alternative is something like a VoWLAN handset maker licensing Boingo or another company's platform to provide authentication behind the scenes. But that ties you to the network run by Boingo et al. 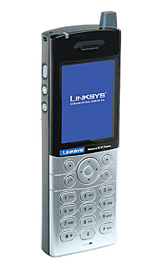 ; this phone allows connection arbitrary networks no matter what method they require for access. Update: Boingo wrote to note that their platform supports browsing for authentication, and includes a scripting language for adding authentication without delving into rewriting program code. The WIP300 has an estimated street price of $220 and the WIP330, $370; they're available now. Woof! I don't know for whom a $370 IP phone is worth that cost, but I suspect certain frequent travelers would like it. I can imagine being in a several-dollar-per-hour hotspot in Switzerland or Singapore, and instead of paying $60 to $90 per hour for calls to the U.S., you're talking over your preferred VoIP+SIP provider at just that hourly rate. For other users, I expect prices will drop pretty spectacularly by next year.